It wasn't my intent to precision cut around the die cut lettering. I should have made it flagged on the right side, lesson learned. 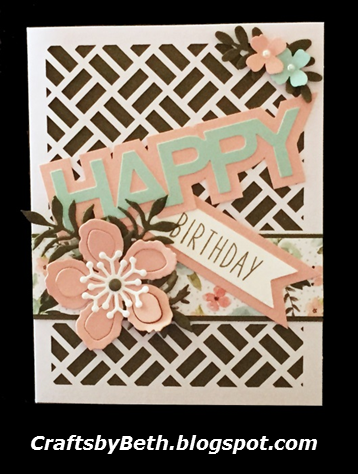 Can you even tell that there is beautiful patterned paper underneath the flower? This card only took 90 minutes to create, the opening bid starts at $9.99! Layer under "Happy" measures 4 1/4" x 1 3/16"
Banner measures 2 5/8" x 5/8"